Various Americana themes are at the forefront of fashion right now from cowboy culture to copious amounts of denim and modern takes on gingham and stripes. Despite having nothing to do with July 4th, these trends just happen to feel entirely patriotic in time for the mid-summer holiday. They’re also fitting for the fashion girl who wants to subtly pay homage without wearing a flag. If a USA-themed ensemble is your thing, by all means, go for it! However, you don’t have to rock a full red, white and blue look to appear Independence Day ready. Instead, you can channel an Americana look by balancing wardrobe staples like a simple white T-shirt, canvas sneaker or distressed pair of jeans with thematic pieces like a handkerchief-style top, gingham dress or striped shirt. To drive a Patriotic look forward, add in trendier pieces like an optic white bag, 90s-style sandal or retro pair of sunglasses for a fresh finish. 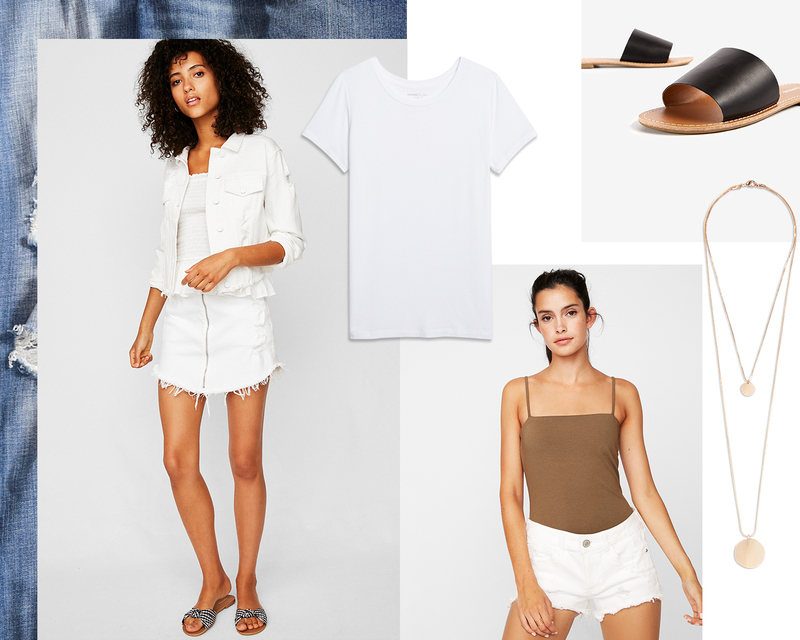 Whether you’re hosting a backyard barbeque, attending a beach-front soiree or spending the day by the pool, we’ve laid out six patriotic outfits themed to various faces of Americana from subtle to star-spangled. Gingham is one of those prints that feels retro and modern at once—a wrap-style dress in the motif is perfect for a picnic or backyard hang. 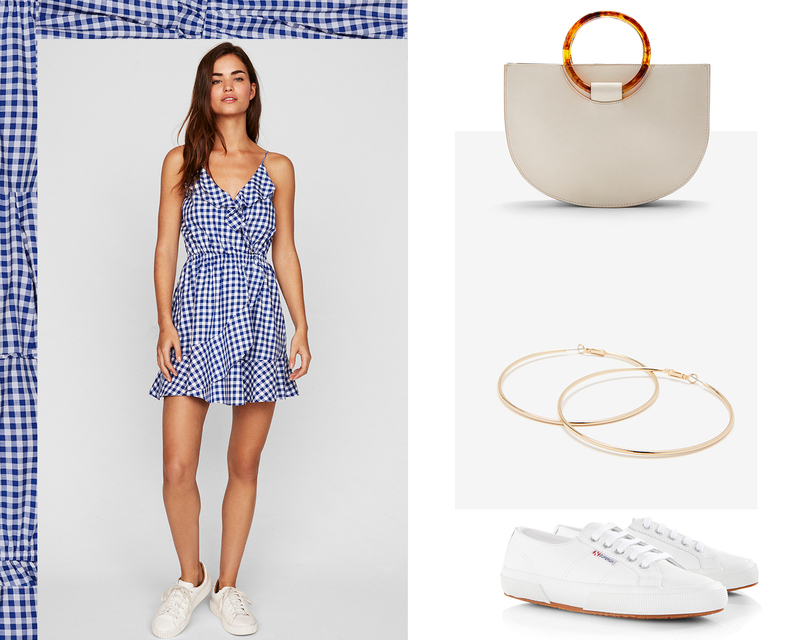 Canvas sneakers will offset the sweetness of the frock while a structured white bag, sleek hoops, and cat-eye shell sunglasses are an elegant finish. If you’re going to be watching the fireworks, you might as well match—or even outshine them. You could even go totally all out with a head to toe look, just keep you accessories simple to avoid overplaying your hand. All things western are back in the spotlight from cowboy boots to embroidered detailing and romantic silhouettes á la the Old West. In the heat, a lightweight denim dress with puff sleeves and corset detailing is darling and won’t feeling suffocating. Ankle-strap cowboy boots and a studded bag keep the theme going while metal-frame sunglasses and silver hoops keep things streamlined. What would Carrie Bradshaw would wear to a July 4th party, you wonder? Our hunch is a handkerchief-print top with light-wash denim. 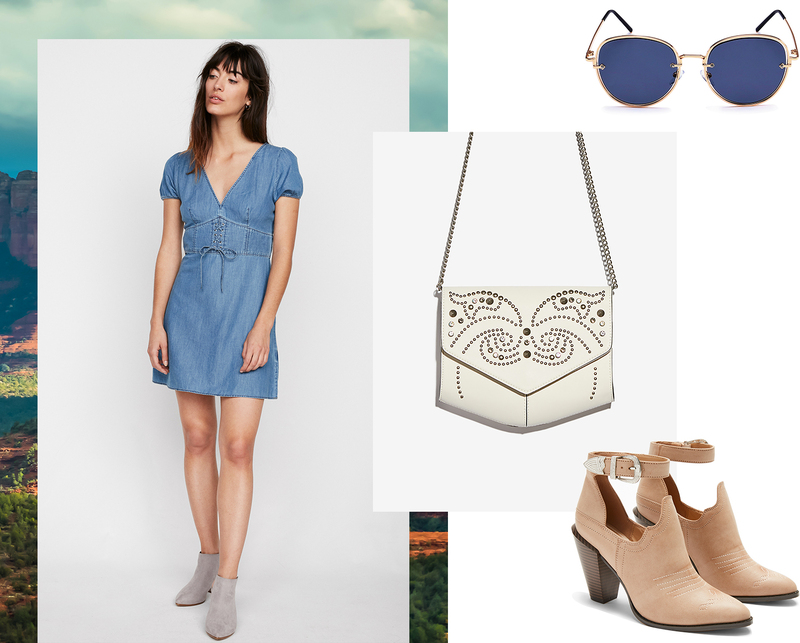 The frayed hems feel perfectly nonchalant while 90s-style kitten heels, drop earrings, and a whipstitch shoulder bag dress things up. It may be referred to as the Canadian Tuxedo, but head-to-toe denim is majorly Americana, too. For a summer interpretation, team cut-off shorts with a white tee and denim jacket styled slightly off your shoulders. Layered pendant necklaces, slip-on slides, and see-through sunnies up the cool factor. Going full-on Patriotic in red, white, and blue doesn’t have to feel cheesy. In fact, it can read entirely chic. A ruffled top elevates true-blue denim shorts—a longer hemline is the updated silhouette this season. White strappy sandals, oval shades and a woven clutch tie the look together for a subtler take on the classic palette.